Mr IRONSTONE is a leading brand in furniture industry. We have rich experience and strong ability in both of design and research. We provide the stable and durable products with low prices. We believe you will be satisfied with the shopping with us. 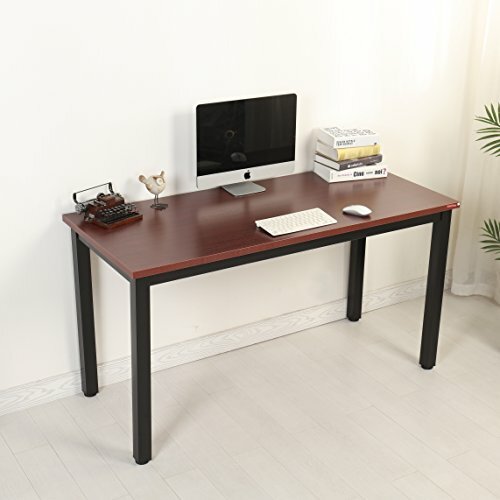 ★ Multipurpose that you can use it as dining table, coffee table, training table, meeting table, computer desk, office desk. Activity table and exhibition table is also suitable. 1、The desk needs to be assembled. In case that you lose or break any hardware, there comes extra hardware in the package. One clear and concise instruction is included. 2、If you have any problem or question, please feel free to contact us at any time. ✔️ AMPLE SPACE: Feature a 47.2'' length, a 23.6'' width and a 29.5'' height, afford roomy table space for monitor, laptop, printer and so forth, allow you freely move your legs. ✔️ SUPER STEADY: Solid wood board panel with wood texture surface is ANTI-SKIDDING ANTI-SCRATCH WATERPROOF and EASY CLEANING; 1.0mm Thicker heavy-duty powder-coated metal frame ensures STABILITY and DURABILITY. Supporting capacity: 800 lbs. ✔️ MULTIPURPOS: Suitable for dining, writing, studying, training, meeting, dressing and exhibiting. Adjustable leg pads ensure the desk keep STURDY even on UNEVEN ground. Addition to home, offices, apartments, and college dorm rooms. ✔️ EASY TO INSTALL: Just need to install 4 legs with 8 screws (less than 15 minutes) Clear & concise instruction and extra hardware included. ✔️ MODERN&SIMPLE: Combining wood texture surface and metal frame, this table easily matches rooms of all kinds of styles; and it can also be perfect for any kitchen. If you have any questions about this product by Mr IRONSTONE, contact us by completing and submitting the form below. If you are looking for a specif part number, please include it with your message.